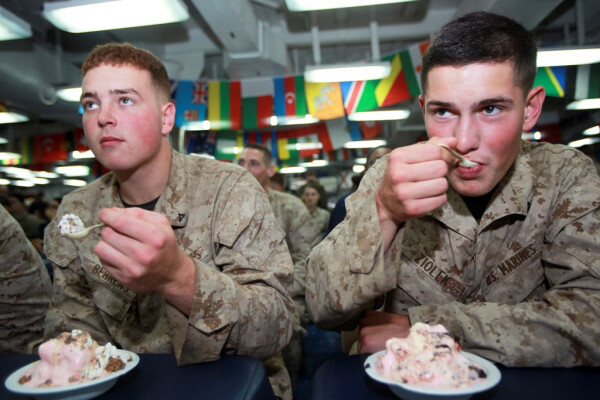 You have to wonder how quickly these Marines devoured that ice cream. Amphibious assault ship Makin Island held an ice cream social for Marines and sailors aboard the San Diego-based ship, which has been deployed in the Arabian Sea region with the 11th Marine Expeditionary Unit and a three-ship amphibious ready group. As these junior Marines are learning, sweets like ice cream, cakes and cookies are often readily available aboard many if not all ships at sea, yet they still are familiar, comforting. Besides, you can’t really ruin ice cream, or most any dessert for that matter. Ice cream is more the rarity for those training in the field or deployed away from the large camps in the combat zone of Afghanistan (though you might be lucky enough to find some while on patrol). But as more Marines get to experience the different pace of life at sea, and in new places like Australia, the Philippines or South Korea, dessert will be just one of those constants when the meals might vary from rations to local but unfamiliar favorites. So whether it’s ice cream, cake or cookies, few will pass up the chance to indulge in those simple comforts that often remind us of home. And it certainly beats the sweets that come with MREs. Granted, food of any kind is a great unifier, as Marines and others got to experience during exercise Balikatan just recently, and there’s plenty of chocolate and candy, along with goodies from home, sent overseas to Marines. Still, some chilled ice cream, with or without toppings like cherries and whipped cream, and freshly-made cookies won’t last long no matter where it’s available. 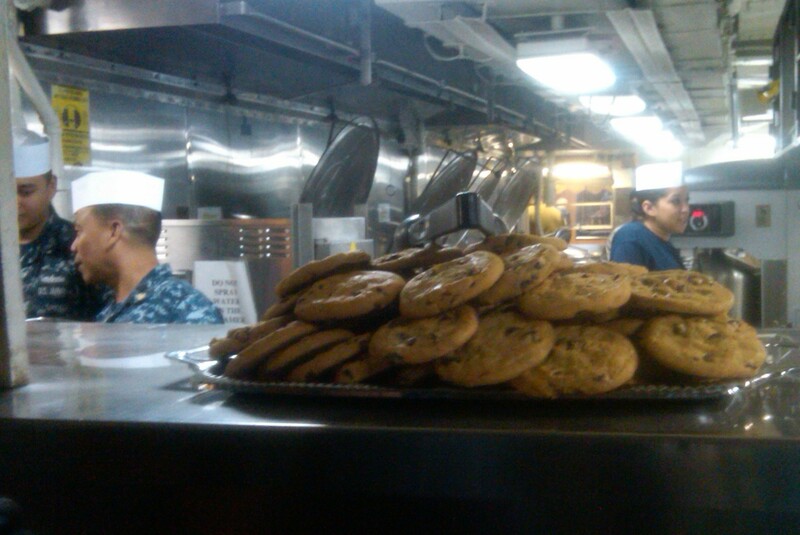 During Defense Secretary Leon Panetta’s visit in late March to the Peleliu, an amphibious assault ship training with the 15th MEU off the coast of Camp Pendleton, Calif., the culinary specialists in the ship’s galley served up to the crew plates of fresh chocolate chip and oatmeal raisin cookies. The top civilian at the Pentagon? He enjoyed two of the oatmeal raisins. Can you name your favorite? Jonathon Ziolek is my cousin. I haven’t see him in some time, but it’s great to see him finally.